It looks like there is either an alien city on Ceres, or giant diamonds there. Updated on 7/1/2016. Ceres is a dwarf planet located between Mars and Jupiter. It has an equatorial diameter of about 601 miles and a polar diameter of about 556 miles. NASA has asked for help in explaininig strange lights coming from it at the Occator Crater. It has been said that ice, salt flats, ice, volcanoes or geysers seem to be the predominant theories at the moment, with the bright spots appearing to reflect incoming sunlight towards the spacecraft's cameras. On June 29, 2016 JPL released a study that indicates the crater has the highest concentration of carbonate minerals (mostly sodium carbonate) ever seen outside Earth. It has a central pit about 6 miles (10 kilometers) wide with a dome structure at the center, covered in highly reflective material, that has radial and concentric fractures on and around it. Sodium carbonate is a kind of salt found on Earth in hydrothermal environments. They claim the material appears to have come from inside Ceres, because an impacting asteroid could not have delivered it. However, one crucial topic is not addressed in the press release. Was any attempt ever made to photograph the crater when it was in the dark as the Dawn spacecraft orbited it? If what we are seeing is a reflection of sunlight, it should vanish when the sun sets. But the light appears all the way across Ceres from when it first appears on the left limb to the time it disappears on the right limb. Further at the limbs there is no evidence of outgasing that appears. More people select "other" as the cause. It's still not entirely clear that these lights are not due to built structures. The Torah Code matrix shown in Figure 1 is discussed at the end of the article. Figure 1 above: Matrix matching CERES ALIENS with LIGHTS and DAWN, the name of the NASA space probe that took the pictures of the lights on Ceres. NOTE THE UPDATED PHOTO OF THE LIGHTS TAKEN IN SEPTEMBER, 2015 FROM AN ALTITUDE OF 915 MILES. The animated FIGURE 2 video clip above is from http://www.dailymail.co.uk/sciencetech/article-3089818/Mystery-alien-lights-Ceres-never-seen-Dawn-probe-zooms-bright-flashes-4-500-miles-away.html. This animation shows a sequence of images taken by Nasa's Dawn spacecraft on May 4, 2015, from a distance of 8,400 miles (13,600km), in its RC3 mapping orbit. The image resolution is 0.8 mile (1.3km) per pixel. Note that on the time-lapse view below the lights in the crater when it reaches the right limb of Ceres only go invisible when the walls of the crater obscure them. This again speaks to the fact that the lights are not reflections of the sun. Instead they are originating in the crater. Since the period of rotation of Ceres is about 9 hours 4 minutes, and since the Dawn spacecraft has been in orbit around Ceres from March 6, 2015, there should have been plenty of time to photograph the 50-mile wide crater that contains these lights while the crater was turned away from the sun. 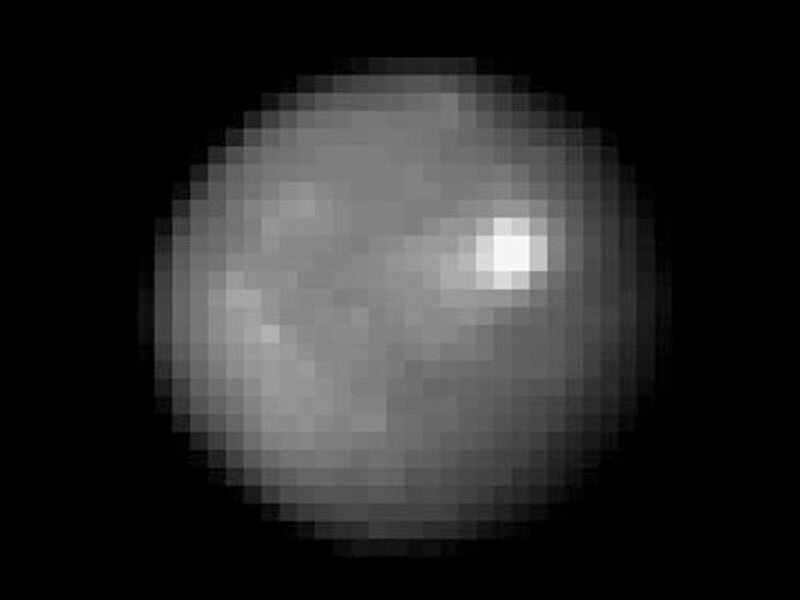 Dawn was orbiting Ceres every 3.1 days when the Animated Figure 3 was made., however when the photo under the matrix above (Figure 1) was taken, Dawn was down to 915 miles above series which it orbited every 19.1 hours. In Ben Bova's Sci-Fi novel New Earth astronauts visit a world that looks something like Earth. When they arrive there and enter orbit they are astounded to find a light shining up at them from the planet's night side. Ceres does not look like Earth, but it likely has a liquid water ocean lying between its rocky core and icy mantle (Rivkin et al. 2006) with more fresh water in it than we find on all the Earth. Obviously, if nothing else is true, Ceres would make a great space station. That we have heard nothing about the attempts to image the lights when it is night seems strange. If the lights are seen when Ceres is not facing the sun the chances rise significantly that the anomaly has an intelligent origin. Indeed, Figure 8 seems to suggest that the lights will persist when it is dark. There is a basic problem with NASA's discussion of the lights. Rather than give us a coherent explanation of what the lights are, they are asking the public for our opinion. This may seem OK, however the problem lies with the choices that we are given. Figure 34 below shows the latest photo taken from an altitude of 915 miles. As of October 19, 2015 the public has voted for ice (backed by 28%), volcano (10%) salt deposit (11%), geyser (6%), rock (6%) and "other" (39%). What can't they simply offer alien life as a choice? That they don't want to go there is reminiscent of the mocking attitude often displayed toward people who report UFOs. The very nature of the questionnaire may indicate that NASA is looking for an excuse for the lights that will be most plausible to the public. At least thet have not suggested swamp gas. As for their approved choices both ice and salt flats should not be so bright when viewed near the limb of the dwarf planet. Volcanoes should have plumes going up into space and deposits around them. These are not seen on the photos. Geyers should display plumes too (again, not seen). There is no known reason why rocks should be so bright. So the plurality of people are right to reach for "other." However, "other" might also include diamonds that might have been formed with an asteroid impact, or that might have been transferred there as a result of an impact on Jupiter or elsewhere. Arthur C. Clark's Sci-Fi novel, 2016: Odyssey Three was based on a such an object being found on Jupiter's moon Europa. There are theories that it actually rains diamonds on Jupiter and Saturn. Internal reflections might help the light to be seen at the limbs of Ceres. Further, diamonds are associated with the Popigai impact crater in Russia. The site of the bright lights on Ceres is an impact crater. Note: If the Government knows that there are trendendous quantities of diamonds on Ceres they would probably not announce it now simply because it would radically drive down the value of diamonds and destroy the wealth of many powerful people. THE LIGHTS ON CERES ARE NOT NEW. Figure 10 below was taken from an Earthfiles News video put out on June 18, 2015. The film includes an interview with the Dawn Principle Investigator, Dr. Christopher T. Russell. Among several items of interest on the film is that although the Dawn Spacecraft was launched in September 27, 2007, the tremendous light coming from this area on Ceres was actually first seen by the Hubble Space Telescope in 2004. Dr. Russell indicated that when Dawn reached the lowest orbit (230 miles) the camera resolution would only allow us to see an area of 40 meters by 40 meters per pixel. This is because NASA did not choose to fund a better camera. There is a reference to some of the lights forming an equilateral triangle, but the pictures taken are not convincing of this assertion. The film does not discuss why there are no pictures taken when the crater was in darkness and the Dawn spacecraft was over it on its orbit. In June, 2015 JPL stated that, "views from Dawn's current orbit, taken at an altitude of 915 miles (1,470 kilometers), have about three times better resolution than the images the spacecraft delivered from its previous orbit in June, and nearly 10 times better than in the spacecraft's first orbit at Ceres in April and May." They offered the video below to give us a better picture of the geology of the Occator crater. BIZZARRE SIDENOTE. You won't find this story on the MarsCorrect.Com version of this article. In operating ArkCode.Com since 2007 I've heard from a lot of incredible tales. This includes many abduction stories, but perhaps the oddest one was from a man (Richard Robson) who claimed to have served on an alien vessel past Jupiter until he knocked a Gray down after the creature poked him in the back. Normally a yarn like that wouldn't make it onto my site. But Rich also claimed to be capable of remote viewing, and as my article about him makes clear, he did a pretty good job of describing odd things in my home even though he was thousands of miles away. I won't say that I believe what he claims to have seen and done in space, but when trying to learn if anyone is home on Ceres, which sits between Mars and Jupiter, Rich might have some answers. STATISTICAL SIGNIFICANCE OF FIGURE 1. As per my standard protocol, no statistical significance is assigned to the axis term, here CERES ALIENS (at its only occurrence in wrapped Torah). The most significant a priori find was LIGHTS at skip +1. It was found at this best case skip against odds of about 102 to 1. The name of the spacecraft sent to Ceres, DAWN was at skip -1. Odds it being found at a special case skip (+/- 1 or the skip of CERES ALIENS) were about 5.3 to 1. Overall the matrix was found against odds of about 547 to 1. The word DIAMOND did not appear on Figure 1. There are 4 ELSs of CERES DIAMOND in the Torah and three of them have the word LIGHTS on the matrix, but not at special case skips. They do not appear to be statistically significant.